For more than 10 years now, over 300 teams are annually participating in the most internationally renowned student competition for synthetic biology known as “iGEM”. As a part of the international Genetically Engineered Machine competition (iGEM) they find solutions to various contemporary problems using genetic components in different biological systems. This year, we – a group of 15 students from Dresden, Germany – are taking part by realizing our own research project. In this competition though, more than biological bench work is demanded from us students. A successful team also has to consider the aspects of biological safety, public relations, documentation and funding of their project. However, our team likes to take it one step further by taking responsibility for the environmental impact of our research during iGEM, and especially for the related trip to Boston in November this year. Therefore, we started the “iGEM goes green” initiative. We want to investigate the ecological footprint of our work as a team, as well as find ways to reduce it. Furthermore, we want to encourage as many teams as possible to think about and get involved in sustainability. 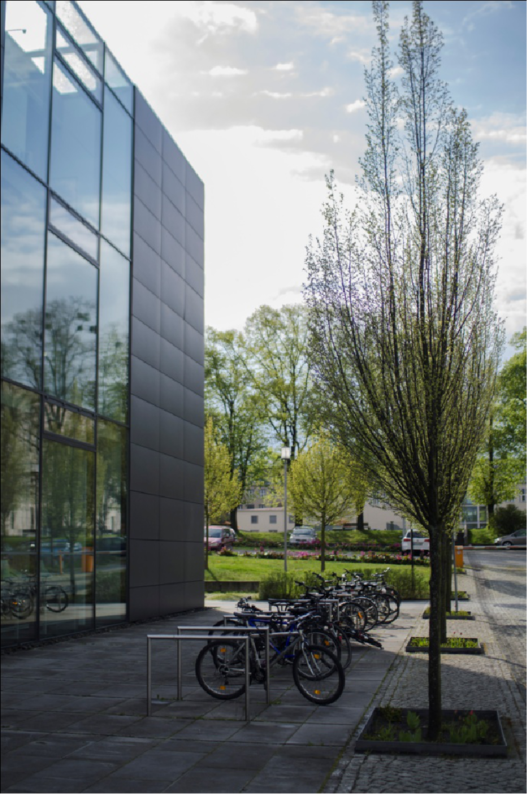 “Knowledge creates sustainability” - Our little headquarter harboring our office in front of the TU Dresden Biology Institute (right image) where the iGEM Goes Green meetings are taking place. Due to the high security regulations in biological laboratories it is not possible to simply turn off devices and systems (e.g. ventilation) to save energy. Despite this, we still believe that lab work can be shaped into a more sustainable practice through good planning and the conscientious usage of resources. We plan on gathering the data we need to calculate our ecological footprint by tracking our lab consumption of materials and energy for a set period of time. This will help us to identify possibilities to organize processes more economically friendly. To easily share our idea and prospects with other iGEM Teams, we have summarized information about environmentally-conscious lab work in our so-called “GoGreenGuide”. This guidebook contains notes concerning the sustainable organisation of meetings, instructions on how to calculate your labs greenhouse gas emissions, options for compensating those emissions and suggestions for personal sustainability. At the moment, this guide is our very first version that hopefully will expand over time through lots of external input. 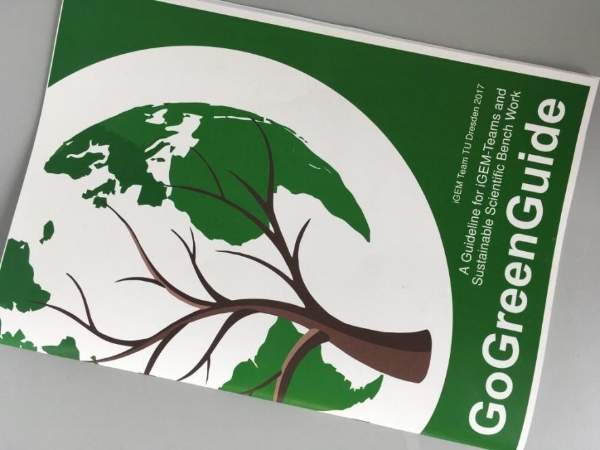 The GoGreenGuide is available online and full of interesting information about sustainable lab work, Carbon footprint calculation and how to get involved. You can find the link at the end of this blog entry. From June 30th to July 2nd we hosted a German-wide iGEM team meetup, which gave us a prime opportunity to apply the recommendations on greener meetings ourselves, and to get the other teams involved. We organized a workshop to inform the other teams about our vision and how to be a part of iGEM Goes Green. To engage the public in our endeavours, we will host discussions with experts and more events in cooperation with other environmental initiatives throughout the year. For our Team Meetings we always organize snacks. Therefore we go to a store where you can fill up jars with dried fruit, nuts or gummy bears. The highlight of the iGEM year is the concluding conference in Boston in November, where all teams will present their results. Thus, our team plans to compensate for the CO2 emitted by the flights by supporting environmental projects and buying climate certificates. We highly hope to motivate other teams to do so as well. As a symbolic act, we also like to plant trees in Dresden or its vicinity. With “iGEM goes green” we have the vision to stimulate not only other iGEM teams, but also research groups worldwide to act more sustainably. We want to plant the green thought in other’s heads! The whole TU Dresden iGEM Team – A mix of international students that intend to make the scientific world aware of what we can do for our planet by just changing small things at work or even in our personal life.